Dubai: There’s a new delivery service in town, and no, it doesn’t transport food. 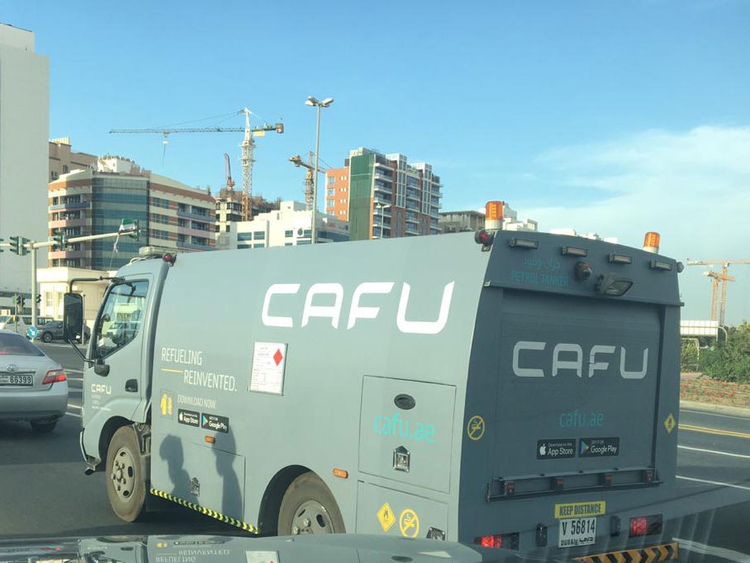 The petrol-delivery app CAFU, which was recently upgraded on November 30, 2018, has received over 10,000 downloads and delivers Super 98 and Special 95 fuel to residents in Dubai and Ajman. On the company’s profile, organisers described the on-demand fuel delivery service as a simple and safe way to save time instead of queuing in line at the petrol station. “Our objective is to always charge you the same amount you’d pay at any of the petrol stations for Regular and Premium petrol, along with a small delivery fee,” it said, pointing out that customers will be charged Dh18 for each delivery. The Ministry of Energy and Industry earlier announced fuel prices for December and the price includes VAT. The per-litre prices are Super 98 at Dh2.25 (down from Dh2.57 in November), E-plus 91 at Dh2.05 (was Dh2.38 in November) and Special 95 at Dh2.15 (down from Dh2.46 in November). The fuel delivery app, which operates in collaboration with Emarat petrol company, first requires customers to register their car details. Basil Ayass, a cutomer, said: “Super convenient service. One bug – Once you’ve added a car, you can’t delete it or change the preference of petrol, Special or Super”. The Abu Dhabi National Oil Company (Adnoc) confirmed to Gulf News that it is continuing trial runs for its new service Call to Fuel, which provides residents with the option of having their petrol delivered to their cars. Once the service is launched on Adnoc’s app, motorists can choose which type of fuel they prefer – Special or Super – and after picking a suitable date and time, can get their cars filled at the click of a button.